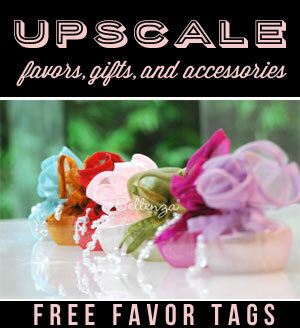 You may think of these as floral, fruity, or even jewel tones. 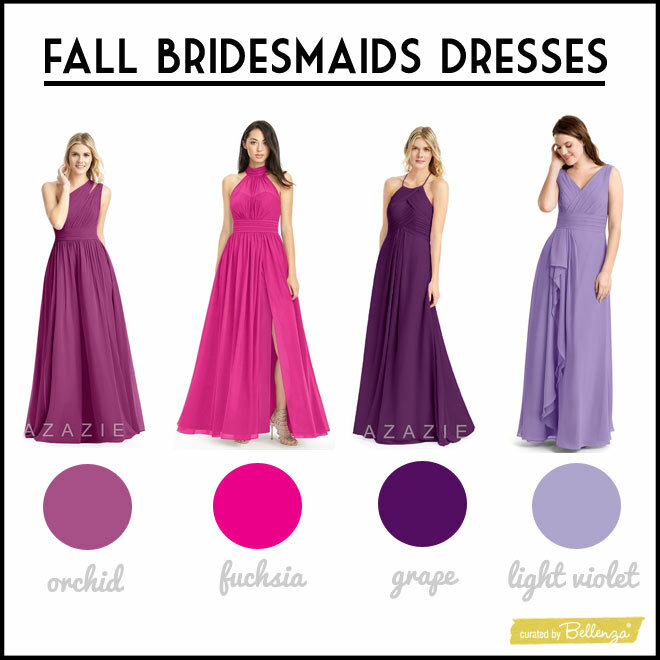 But no matter what you call them, these rich, vivid colors are sure to make your bridesmaids stand out at your fall wedding. Dress details we love: A peekaboo shoulder cutout adds extra flair to the classic one-shoulder design, pleating at the bodice and waistline creates a feminine fit, and hidden pockets allow your ladies to have their beauty essentials on hand! Dress details we love: A halter shoulder treatment, high choker-style neck with a bow at the nape, an illusion back, and a glamorous side slit on the A-line skirt. Dress details we love: A-line cut in flowing chiffon, a halter neckline with stylish draping on the bodice, and a jewel button to secure the straps in the back. Dress details we love: A feminine A-line/princess cut in flowy chiffon, with a V back and neckline extending to a cascading ruffled skirt detail from waistband to hem. 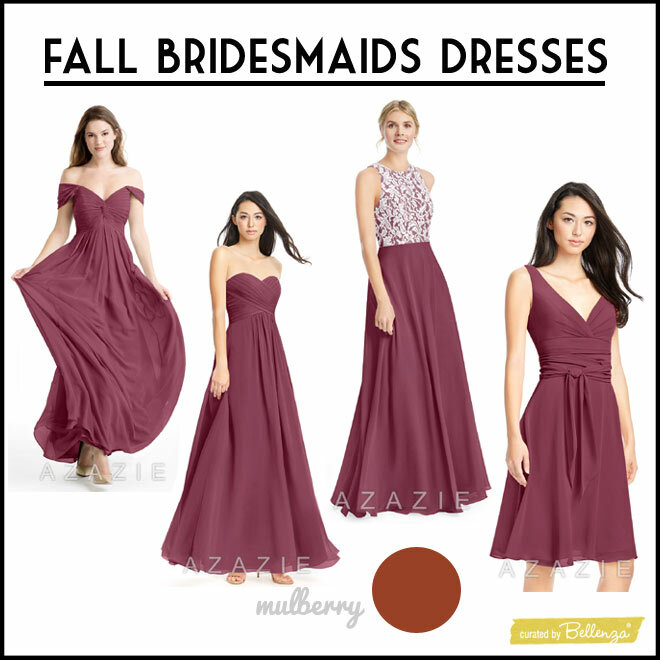 Envision your bridal ladies wearing varied gown designs all in this deep berry-like color! 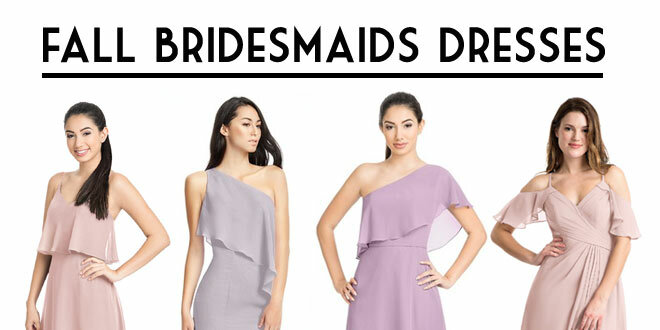 We found it so elegantly muted in these bridesmaids’ dresses from Azazie. Dress details we love: A sweetly daring off-shoulder V neckline, softly gathered bodice, and an empire waistline that flatters all figures. Dress details we love: An Azazie bestseller featuring a strapless, sweetheart neckline with criss-crossed ruching on the bodice, and a flowing A-line skirt. Dress details we love: A beautiful white lace overlay on the bodice contrasting with the chiffon skirt, a scoop neck and racerback style, and practical hidden pockets. Dress details we love: A youthful, knee-length option with a V neckline and a detachable waist sash that ties into a bow for an interesting finish. 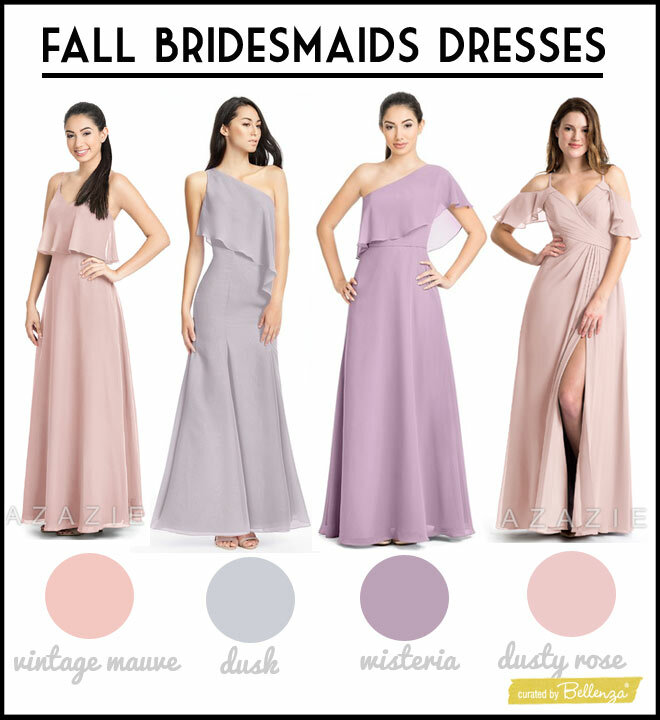 Create a visual play of subtly varied hues, using bridesmaid dress styles that have similar design elements. In this case, we chose Azazie gowns with lovely fabric draping variations in related colors. Dress details we love: A gorgeous goddess effect with a v-neck, cropped overlay top and twisted detailing on the spaghetti straps. Dress details we love: A trumpet/mermaid cut that hugs the curves, and a one-shoulder neckline with a flowy chiffon overlay. Dress details we love: Another one-shoulder gown but with an A-line skirt, topped with an asymmetrical ruffle-effect overlay. Dress details we love: A ruffly cold-shoulder style complete with a back keyhole and side slit in the flowy skirt, perfect for dancing the night away. Go for autumn elegance using sophisticated neutrals in place of strong seasonal shades. 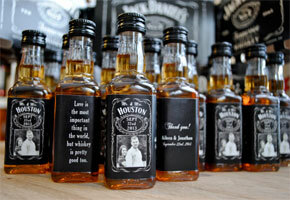 And in keeping with the stylish approach, choose a single gown design as we suggest here. Dress details we love: A sense of movement and grace thanks to a multi-layer chiffon skirt in cascading different lengths, topped by a strapless bodice with a sweetheart neckline and a twisted front gather. Can you tell we can’t wait for the fall wedding season to start? 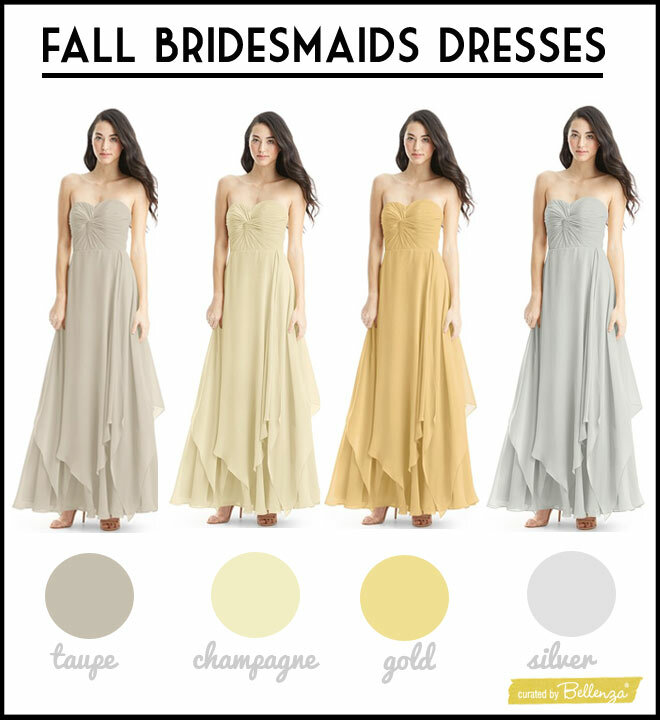 With such captivating color options for your bridesmaids’ dresses, we’re sure you feel the same! 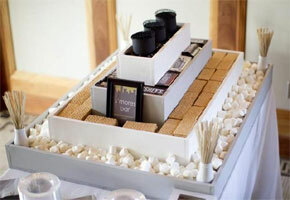 Previous Beach Themed Bridesmaid Proposal Boxes: Surprise Your Girls!